We provide beautiful sunset cruises for that special person in your life or just a relaxing cruise to take with the family to see the sun set over the water. Our tours are $125.00 for two people and any additional person is $50.00 per person. The trips last about 2 hours. We call you the day of the sunset to give you the exact time of the sunset for that day and we ask you to be here an hour and 15 minutes before sunset. We will leave from our dock an hour and 15 minutes before sunset. We take the most scenic route while traveling down the river. You will also see some beautiful wild life such as pigs, different types of birds Ospreys, Bald Eagles, Pelicans, Cormorants and fish. We also have manatees in the area that you will possibly have the chance of seeing from the boat we also might have the chance of seeing some Dolphins playing and feeding while we take a trip down the river. Bottlenose dolphins often interact with the boat as we cruise down the river which is always a bonus on any Sunset cruise. You may also see turtles, apple snails, and blue crabs while we travel in the boat. There are different types of turtles also known as “cooter” here in Citrus County they are the river cooter, common cooter, Florida red-bellied cooter and the Suwannee cooter. We also have large Tarpon that weigh up to 125 pounds that you can see and also hand feed right from the dock at Pete’s Pier. We have spotted a bear once before, when the weather is beautiful we do take a ride around Shell Island. We also have a power plant located here in Crystal River that you will see along our cruise down the river. 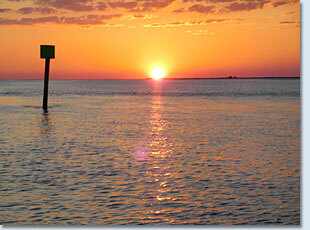 We drop anchor at the mouth of the gulf where you will see the most breath taking sunset of your life. We do provide bottled water for everyone on the boat but if you would like to bring a small cooler for drinks you are more than welcomed to do so. We have had some couples take advantage of our sunset cruises by asking their partners to marry them as the sun went down. If you have never seen a sunset on the Gulf of Mexico you should book a tour so you can experience the true meaning of breathe taking. To book a Crystal River Sunset Cruise, call us direct at 352 445-5489.